My Lumicycle Freeway arrived this Monday. I’ve now had a week commuting with it, trying it in different situations including street lit roads, unlit roads and Sustrans paths. My choice was between the Freeway and the Apex. The Apex costs £40 more for just the lamp at £155 as opposed to £115. I already own an old 4Ah NiMH bottle battery. I didn’t consider the Race model having read reviews that indicated that the Freeway was adequate at the speeds I ride. The main differences between the Freeway and Apex are the beam angle and the efficiency of the LEDs. Apex produces about twice as many lumens as the Freeway which it spreads over a wider beam. It achieves this with far less than twice the input current. Lumicycle Freeway 2014 next to a Smart 2W commuter light. Lumicycle note that the Freeway is good for commuting and road cycling at any speed. I have found it comfortable at 30mph. 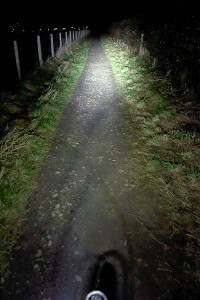 The Apex is marketed as a superior road light and good for paths and trails. Lumicycle’s web page highlights that the Freeway should not annoy other road users. Lumicycle tell me that the Apex would need to be kept in its lower power settings and be sure to not aim it across the road. I have found that I don’t need the full power of the Freeway. 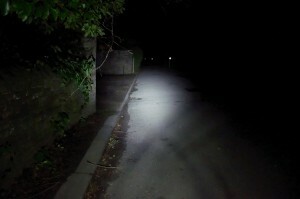 MID at 300 lumens, 2.4W, is adequate at 20mph on dark unlit country roads. HIGH does not really increase the lit area, but can reveal more fine detail where it does light. Higher power can help if your eyes have to recover from oncoming cars, if you’re trying to compete with other light sources, or if you’re travelling at 30mph or more. BOOST is bright, but only half an f-stop above HIGH for a fair amount more input current and therefore lower run time. I’d see myself running LOW around town unless I need to compete to be seen, MID on the open road and HIGH when travelling fast or in more difficult situations. I don’t know how Freeway HIGH and Apex MID compare in terms of light on the road and how much I can see. Apex’s beam is wider so the light is spread more thinly. If they are similar then the Apex on MID would give a bright light for not much less runtime than Freeway’s quite adequate MID mode, and a lot more runtime than Freeway’s bright HIGH mode. 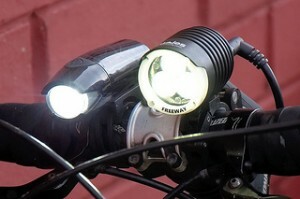 Both of the around town LOW modes give similar light output, but Apex will last 83 hours to Freeway’s 61. Maybe someone doing the kind of touring that needs them to consider such long runtimes would buy a dynamo. The Freeway has a quite narrow beam. Looking at the light pattern on Road.CC’s review site it is vertically asymmetrical in a way that makes sense when projected onto the road, wider at the bottom narrowing at the top. The optics appear to have a diffuser in front with lines running at an angle. The narrow beam makes setup important. My first outing saw it aimed too high to give a more distant spot on the road. The spot moved about a lot as I made steering adjustments and I felt I was turning into darkness. I found riding a very potholed track difficult with the beam high. A slightly lower position has improved things a lot and made things quite comfortable on all but the most winding roads. I find that consciously leaning the bike can help move the spot to where I need it. I was able to travel at my normal 10 to 12mph on a stony bridleway easily avoiding the very large stones in places, and will have to reattempt the potholed track. I have included beam photographs. Like everyone else who has tried this I find that I cannot easily convey the feeling of riding with this – at least not without some editing. My photographic software (Perfectly Clear) is designed to produce pictures not scientific records. I’ve turned down the processing but it’s still there, and tries to increase local contrast in the photo. The exception is the “Unlit Road” photo in which I disabled it. I’d say that the contrast shown in the photos is exaggerated, and my eyes were able to make out details lost in the black in the photos. I estimated the lightness of the Unlit Road as photographic “Zone 4”, about 1 stop below normal, so set my camera 1 stop down. This also allowed me to avoid the need for a tripod, but has resulted in loss of detail in shadow areas. This image shows how narrow the beam is, and how good the optics are to give a pretty consistent projected beam. The lines are shadows of my gearing cables which run in front of my lights. The bottom of the image is close to my front wheel. The bright objects further along the road are road signs, which are well illuminated in spillage light. I found cycling on country lanes that the hedge to my left was generally lit, as was the side of the road. The hedge on the far side of the road was generally unlit, so reducing the chance of dazzling oncoming road users. This beam gives me a few seconds to react to an object in the road when cycling at 20mph. In comparison to the 2W Smart, the Freeway is brighter and wider. The Smart’s very narrow beam can be focused ahead of the Freeway and blend when the Freeway is used on LOW or MID. The Smart is not useful on its own for unlit roads. Lumicycle Freeway on a bridleway. Wide angle (18mm lens). This image was taken with a wide 18mm lens. This will make distances appear shorter, but allows me to show the light close to my front wheel. This is more important on rough terrain. Again MID power, 300 lumens at 2.4W, was adequate here. I was able to keep track of oncoming obstructions and avoid them. As I steered around obstacles I noticed that the spot would move completely off the path so losing ahead vision. This did not make riding hard as I’d slowed down at this point and was using the light near my front wheel. This is a “Road Light”. Off road riding is an area where the Apex would perform better. I found that a path through a wood, where the high wind had brought down leaves so making the path harder to follow, was harder with the narrow beam because I had to try to see which side of the trees the path was on. I couldn’t illuminate all possible routes at the same time. I generally don’t do this kind of riding. A jogger coming the other way shielded his eyes when he came close, so I shielded the lamp to allow him to pass. This was a path in almost complete darkness with only some reflected town light in the sky, so any torch or light would destroy night vision of someone walking or running without a torch of their own. 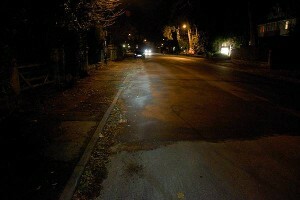 The road pictured had street lights at wider spacing than normal, so was more dimly lit. The Freeway is on MID power here and can be seen filling the gaps in the street lighting. I have ridden around town in brighter lighting on LOW, using the Freeway just to be seen. It’s still bright when standing on or near its axis. Power here is 0.8W, so should give 60 hours on my battery pack. The Freeway is certainly bright, especially viewed on-axis. 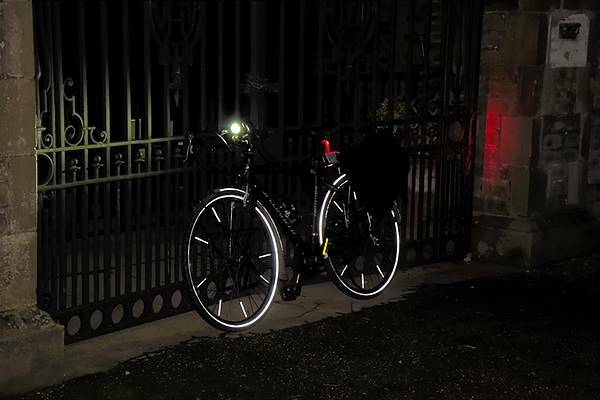 The glow ring will help visibility from the side, though my bike has drop bars which means that I obscure the light when riding on the hoods. The only problem I’ve ever had with being seen was then I was cycling away from a junction with a lot of stationary cars waiting behind me. My halogen light was not noticed against their more distant bright lights, and my reflective clothing was not useful for a driver who’s own lights were perpendicular to the road I was on. Given this chance it may be useful to use MID in town. I have found with other lights that flashing modes can make it harder for drivers to judge distance. They also make life harder for me if the light is contributing to the light I am using to see. I currently only use solid front lights, and a mix of solid and flashing rear lights. Some reviews of the older LED3Si complain that the light has to be switched off to move between solid and flashing. 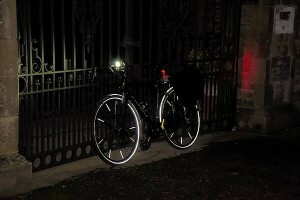 Lumicycle have fixed this in the 2014 version, and now provide the flashing mode in the normal power sequence below LOW. My bike, taken with flash showing how reflectives and the lights work to help it to be seen. It can be difficult to choose between the lights if not able to try them both before buying. This is a problem with Internet shopping. Lumicycle have been very helpful and told me that I can try the Apex by ordering it then returning the one I don’t want. This adds the cost of return postage to the exercise, but allows me to try before I buy. This exercise, and getting used to the Freeway, have improved my impression of it. I have tried it on some quite fast winding roads and found that, although I am on the edge of the spot a bit on the corners, I can travel fast and can generally position the bike to get the spot where I need it. I am coming to the conclusion that, of the two lights, the Freeway was a good choice for my usage. If Lumicycle didn’t sell the Apex and show its wider beam I expect I’d not sit here wondering and just take the Freeway as a very good road light. The Freeway is £40 cheaper.